In these quiet few weeks leading into Arena of Valor‘s inaugural eSports tournament, a new playable hero is about the best we can really look forward to. And that’s exactly what we’re getting! We’re kicking off this week’s Arena of Valor news roundup with Baldum ‘The Monolith’. We’ve mentioned this hulking beast before, but this time it’s for an actual release. Baldum has teased us since even before Arena of Valor’s US debut by constantly appearing in videos filmed on an Asia version of the game and picked up on by Europeans during its early release. For months characters were released far outside the schedule seen in other territories, bringing those that came after Baldum into the game far before himself. It was hard to guess when the forest protector would make it over, but some not-so-subtle hints late last week confirmed his impending arrival. Much like Rourke, Baldum appeared through the in-game shop a little early, teasing players further with the usual Friday release. That’s today. Before that, players were free to test out his kit in the AI arena through the ‘Hero Trial’ option, but you can now officially pick him up for competitive play if you have the Gold or Vouchers to make the purchase. With rock solid defense and a fairly low difficulty curve, Baldum is the beginner friendly tank that could help fix some of AoV’s team composition problems. Just keep throwing more tank and support heroes in there and we’ll be on the right track! You might not know much about the international teams spearheading the AWC Group Stage tournament next week if you didn’t manage to tune into the Boot Camp stage a few weeks before. The Group Stage promo reel posted to the Arena of Valor YouTube channel last week helps fill in the gaps. The video gives a brief overview of what to expect in the 3-day Group Stage tournament set to kick off early next week, and gives us a quick look at each of the teams set to take part. Much like how we had a qualified team drop out of the E3 leg of the Valor Series, so too has Phillipines, cancelling their appearance at the AWC Group Stage for a reason not disclosed in the video. Those still in the tournament will battle it out across 3 days, with America facing off against Thailand on Day 1 and Europe against Chinese Taipei Wildcard on the second. A full breakdown of the group stage schedule can be seen at the end of the video. We’re not leave much to the imagination with the headline here, but the official Arena of Valor YouTube channel just put our two videos detailing the EU and US teams set to battle it out in the Arena of Valor World Cup later this month. With the Group Stage matches set to take place in just 5 days, it’s time to learn who you’re likely rooting for. For the Europeans in the room, you’ll likely be cheering on For The Dream, a team that consistently made a splash during the ESL Go4 Cup days. It’s their video you’ll see at the bottom of this topic (they’re my home team! ), but you can watch the NA team Allegiance introduction through YouTube here. Keen-eyed eSports followers will note that Rocker, who was present for Allegiance’s Valor Series win at E3, is a no-show in the video. The comments all ask the same question, yet Rocker seems too elusive to give an answer and his Twitter account is practically barren, showing that he was likely pressured into using it for his AoV career. What could have happened is anyone’s guess, but he’s evidently not going to be playing during AWC. Last week saw the release of Space Ronin, a very Star Wars-esque skin for Butterfly that came just a week after her maligned default skin rework. Like most of the alternate skins hitting Arena of Valor, Space Ronin Butterfly looked set to arrive without much context. But just after last week’s roundup went live, so too did a small behind-the-scenes look at the design process. The post, made to Facebook last week, dishes out a small lore nugget telling of an Empire assassin gifted a sword that drastically increased her killing potential. 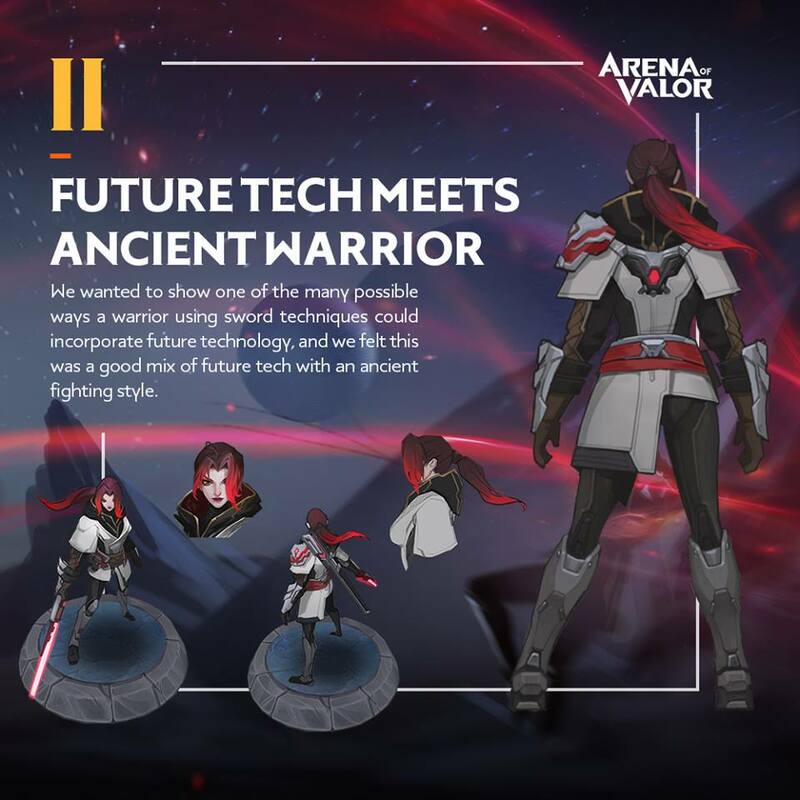 On the next, Tencent explains how they simply aimed to mix the ancient combat style of swordsmanship with future technology. The text of each slide is framed with original designs and stills from the game. There’s nothing substantial – like the many WIP designs of Wisp – but it could act as a reference to those looking to design their own character skin for any future competition. Tencent seem to love those if you keep up on the Arena of Valor Discord channel.